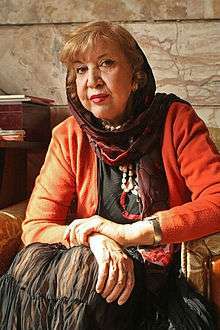 Simin Behbahani (Persian: سیمین بهبهانی‎‎; 20 June 1927 – 19 August 2014) was a prominent Iranian contemporary poet, lyricist and activist. She was an icon of modern Persian poetry, Iranian intelligentsia and literati who affectionately refer to her as the lioness of Iran. She was nominated twice for the Nobel Prize in literature, and "received many literary accolades around the world." Her surname also appears as Bihbahani. Simin Behbahani, whose real name was Simin Khalili (Persian: سیمین خلیلی‎‎) (سيمين خليلی), was the daughter of Abbās Khalili (عباس خلیلی), poet, writer and Editor of the Eghdām (Action) newspaper, and Fakhr-e Ozmā Arghun (فخرعظمی ارغون), poet and teacher of the French language. Abbās Khalili (1893–1971) wrote poetry in both Persian and Arabic and translated some 1100 verses of Ferdowsi's Shahnameh into Arabic. 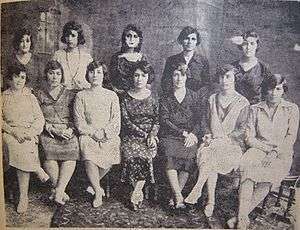 Fakhr-e Ozmā Arghun (1898–1966) was one of the progressive women of her time and a member of Khānun-e Nesvān-e Vatan'khāh (Association of Patriotic Women) between 1925 and 1929. In addition to her membership of Hezb-e Democrāt (Democratic Party) and Kānun-e Zanān (Women's Association), she was for a time (1932) Editor of the Āyandeh-ye Iran (Future of Iran) newspaper. She taught French at the secondary schools Nāmus, Dār ol-Mo'allemāt and No'bāvegān in Tehran. Simin Behbahani started writing poetry at twelve and published her first poem at the age of fourteen. She used the "Char Pareh" style of Nima Yooshij and subsequently turned to ghazal. Behbahani contributed to a historic development by adding theatrical subjects and daily events and conversations to poetry using the ghazal style of poetry. She has expanded the range of the traditional Persian verse forms and has produced some of the most significant works of the Persian literature in the 20th century. She was President of The Iranian Writers' Association and was nominated for the Nobel Prize in Literature in 1999 and 2002. In early March 2010 she could not leave the country due to official prohibitions. As she was about to board a plane to Paris, police detained her and interrogated her "all night long". She was released but without her passport. Her English translator (Farzaneh Milani) expressed surprise at the arrest as detention as Behbahani was then 82 and nearly blind. "We all thought that she was untouchable." Behbahani was hospitalized in Tehran on 6 August 2014. She remained in a coma from 6 August until her death 19 August 2014. She died in Tehran's Pars Hospital and she was 87. Her funeral was held on 22 August in Vahdat Hall and her body was buried at Behesht-e Zahra. Simin Behbahani in Washington DC, ca. 1990. ↑ Fatemeh Keshavarz, Banishing the Ghosts of Iran, The Chronicle Review of Higher Education, Vol. 53, No. 45, p. B6 (13 July 2007). ↑ Behbahani was the last name of her first husband . 1 2 Abbās Khalili, Persian Wikipedia. 1 2 Fakhr-e Ozmā Arghun, Persian Wikipedia. ↑ Annamária Apró (26 September 2013). "Janus Pannonius Prize goes to Simin Behbahani". Hungarian Literature Online. Retrieved 30 September 2013. Wikimedia Commons has media related to Simin Behbahani. Simin Behbahani reads poetry at SOAS, University of London, 6 February 2005, YouTube (part 1, part 2). Sārā Ommat-e Ali, Simin Behbahani: I am alive, in Persian, Sarmāyeh [Capital] Newspaper (Ruz'nāmeh-ye Sarmāyeh). Reprinted in: Association of the Iranian Women (Kānun-e Zanān-e Irani), Wednesday 5 December 2007, . Shahāb Mirzāi, A Line Made From Swiftness and Fire (Khatti ze Sor'at va Ātash), in Persian, Jadid Online, 2008, . A slide show of photographs with text spoken by Simin Behbahani, Jadid Online, 2008: (3 min 56 sec).